Players of "Indepediente", first time in the finals of the 1945 Championship of Argentina. 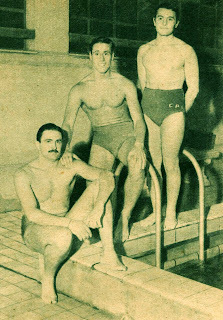 From L-R: D.di Candia, Codaro, Cevasco. 1899: The Champions of Knickerbocker A.C.
1967: The Champions of Sirens W.P.C. 1963: The Champions of Balluta W.P.C. 1959: The winners of Sirens W.P.C. 1957: The Champions of Sliema A.S.C. 1949: The Champions of Neptunes W.P.C.